Brotherton Park’s special visitors. This week we were delighted to receive a visit from trustees of the Charles Brotherton Trust after whom the park is eponymously named. 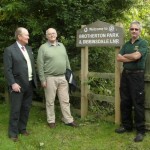 They were David and Christopher Brotherton-Ratcliffe who came and spent the day with us on Tuesday (9/10/2012). Here they can be seen with Alan by the Spital Fields entrance to the park. We were blessed with fine weather and enjoyed a walk through the Park to Bodens Hey meadow and on up to Spital fields before returning to Woodslee to see the walled garden and Visitor Centre. 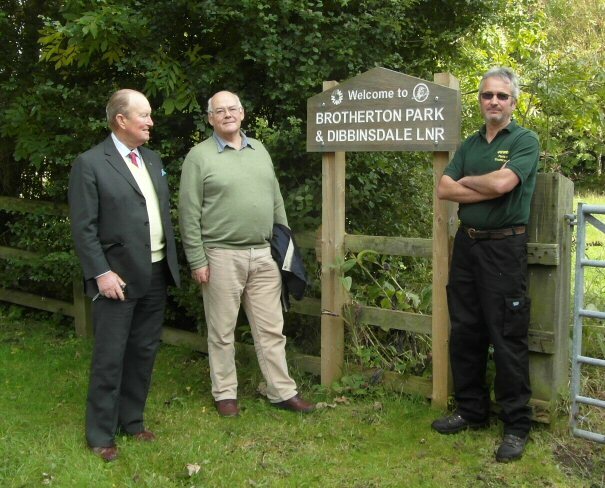 As well as gifting Brotherton Park to Wirral Council the Charles Brotherton Trust provides regular donations to the park to support educational projects and help improve accessibility for the disabled.